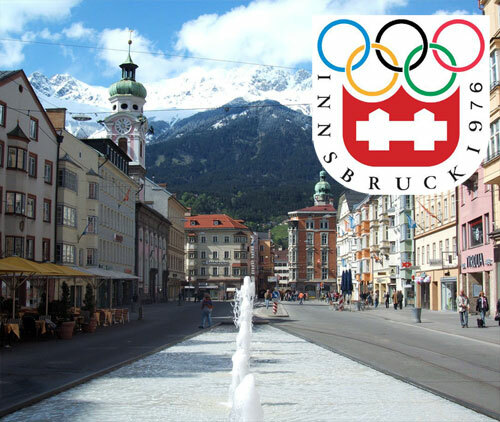 The streets of Innsbruck are virtually empty, then, as almost everyone in the picturesque Alpine town is over at the Olympiahalle watching what will be mostly one-sided matches in the Qualification Round for the ice hockey tournament at the 1976 Winter Games in Austria. The seedings for the ’76 Innsbruck Games ice hockey tournament based on the results from the 1975 IIHF World Championships hosted by West Germany. The withdrawl of Sweden (A3) required a replacement to round out the top six and the continued absence of pucksters from East Germany (B1) at the Olympics enabled their brothers to the west, in the end, to fill that void. Norway (C1) won the C Pool of the 1975 World Championships contested in Bulgaria but also declined to enter an ice hockey squad at the 1976 Winter Games. 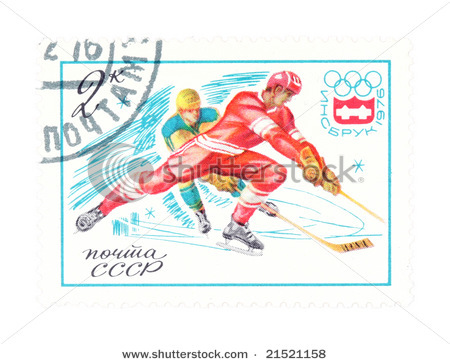 A contemporary postage stamp from the Union of Soviet Socialist Republics attracts attention to the 1976 Winter Olympic Games in Austria; ironically enough, the Soviet skater depicted in the drawing is being trailed by a player in the national team uniform of Sweden, who ultimately chose not to participate at Innsbruck as a result of too many of their top players, such as Anders Hedberg and Ulf Nilsson of the World Hockey Association’s Winnipeg Jets, having crossed the Atlantic Ocean to play professionally in North America.